May your hope be greater than your doubts. May your joy be greater than your fears. May you be more aware of how you are learning and growing than you aware of the things in your life that feel stagnant. And this does not mean that those things do not exist, but it means that you are allowing yourself to recognize that there is so much more to you who you are. For sometimes, it is all too easy to notice everything that is missing in the room you are in. It is far too easy to see who is not there instead of who is. And just like that, the feeling of emptiness settles in, even though there are so many little things you have to be grateful for. So make note of every song, every word that has resonated with you. Remember the kind soul that took the time to listen. Even if it was not the person you thought it would be. Even if you are wanting a little more than an encouraging song to sing, all of these things are pointing to something greater: there are so many things to take delight in, even in the waiting, when you are sorting through your doubts about yourself. 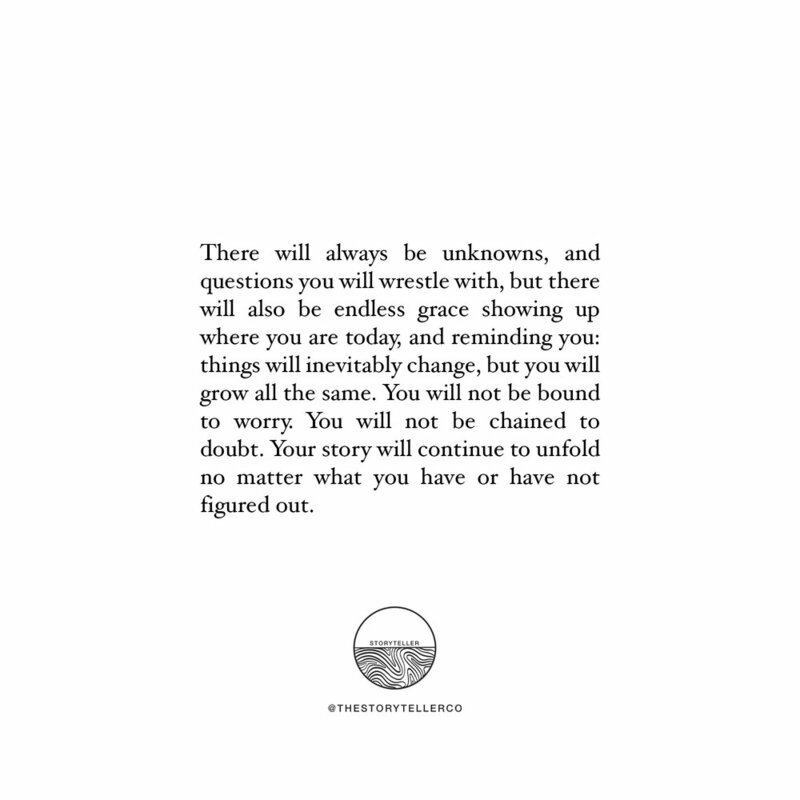 There will always be unknowns, and questions you will wrestle with, but there will also be endless grace showing up where you are today, and reminding you: things will inevitably change, but you will grow all the same. You will not be bound to worry. You will not be chained to doubt. Your story will continue to unfold no matter what you have or have not figured out.